This is a reprint of the letter from the editor in Unwinnable Monthly Issue Eighty-Eight. You can buy Issue Eighty-Eight now, or purchase a one-month subscription to make sure you never miss an issue! 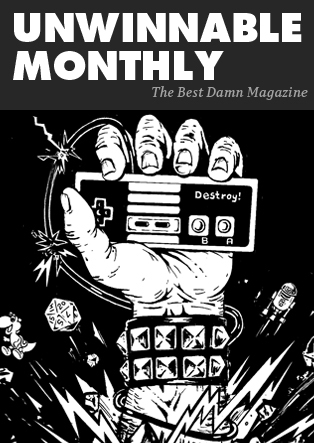 Welcome to a new and improved Unwinnable Monthly! You’ve already seen one of the changes: a simpler, reader friendlier table of contents. From looking at that, you might have discerned another big change: no more theme section. We might bring themes back down the line for special occasions (like Halloween), but for the time being we’ll be favoring a leaner approach to the monthly. After this letter, you have our regular columns. Gavin Craig is still working on Final Fantasy VI in Backlog. Megan Condis checks out the as relevant as ever documentary Welcome to Leith, about white supremacists trying to take over a small town. Casey Lynch gives us a heck of a lot of new metal to check out and Amanda Hudgins explains why people are fanfic-ing characters from Star Wars and Judge Dredd together. Corey Milne ponders Morse code and the game Relay while Matt Marrone takes off on a tangent about Super Mario Run. I dust off my old column, Burnt Offering, to think about how we curate the things we like and how stuff we shouldn’t like sometimes surprises us. Case in point: Rob Rich is surprised he likes Resident Evil 7 and Jason McMaster is surprised he likes Zombicide: Black Plague. Our cover artist, Alex Bertram-Powell, is in the Artist’s spotlight this month. Brian Taylor’s crossword and our monthly recommendations round out our regular contributions. Our new long form section consists of four stories. 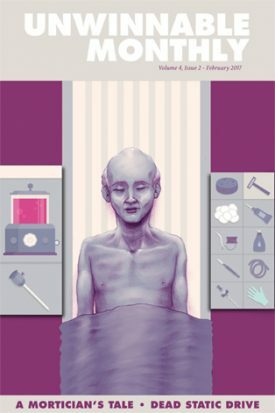 The cover story, “A Good Death,” by Sophie Turner, takes a look at the forthcoming game A Mortician’s Tale, the Order of the Good Death and the death positivity movement. Matt Sayer, in “The Prettiest Nightmare,” takes a road trip with developer Michael Blackney to discuss his forthcoming horror game Dead Static Drive. L. Rhodes brings us this month’s short fiction, a story about information, alternate reality games and corporate dirty dealing called “Orphic Crush.” Finally, in our Unreal Engine 4 sponsored series of Q&As, we talk to the folks behind the upcoming platforming puzzle game The Watchmaker. I am pretty psyched about how everything came together. If you dig it, let me know! And if you don’t, or there’s something else you’d like to see, let me know that too: stuhorvath@unwinnable.com.